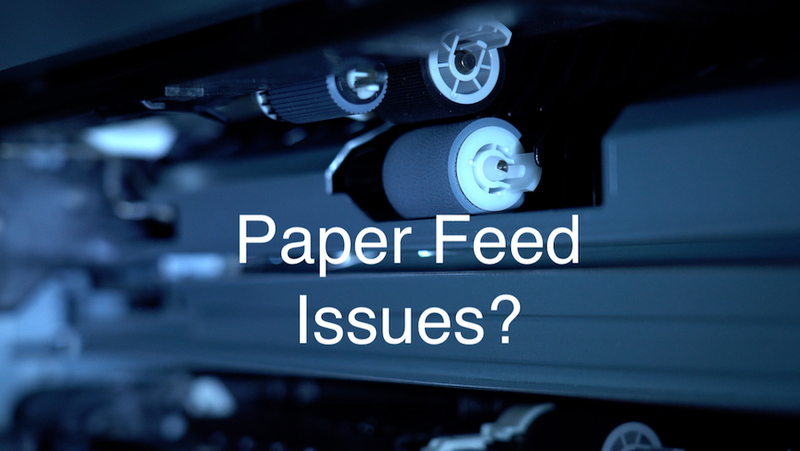 What Causes Paper Feed Issues for Copiers? | Duplicating Systems Inc.
What Causes Paper Feed Issues for Copiers? There are four possible reasons why your copier may jam when it comes to feeding paper during the printing process. Large copiers made by companies such as Savin or Canon have many moving parts and many settings which need to be adjusted. Any one of these parts or settings can prevent the copier/multi-function device (MFD) from properly functioning. High static charge in a ream can cause the sheets to stick together and possibly jam your copier during the printing process. Here is a link to a video showing you how to reduce the static charge in a ream. The normal way of fanning paper, which involves running your thumb down one of the long edges of a ream, causes more static build up in the ream and may increase the chance of a jam inside your copier. The special method of “fanning” paper discussed in the video link above not only reduces static charge, but also checks for glue on the edges of the ream. Glue on the edges of a ream is another possible reason your printer may jam and is discussed later in this post. To set the guides properly, make sure the ream is pushed all the way to the wall of the tray, and then push the guides to touch the edges of the ream. Before placing a new ream into one of your copier’s trays, always check the ream for folded over sheets or glue on the edge of the ream. If either is detected, discard or recycle the affected sheet(s) before placing the ream in the copier. During the packaging process, glue from the ream’s packaging may seep through and get onto the edges. A great way to detect glue on the edge of the ream is to use the special fanning method discussed above to check if the sheets can separate in the first place. Feed rollers are the mechanisms that help feed paper from your trays during the printing process. If they are dirty, then they may not properly grab paper and cause a jam. Feed rollers can be in a variety of places in your printer. Sometimes they will be attached to your printer’s paper trays and in other cases they will be somewhere deep in your machine, not easily accessible. If you have already addressed the previous 3 reasons, then it’s recommended that you contact your printer company’s service department to come clean the feed rollers on your machine. They have special cleaning solutions designed to clean feed rollers, where as other home-made solutions may damage the machine.